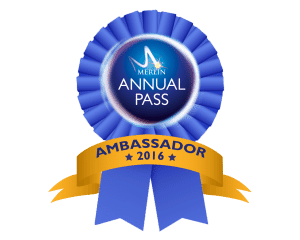 And so we continue our whistle stop tour of Merlin attractions over the Autumn half term. Today we are going to Shrek’s Adventure, on the South Bank in London. 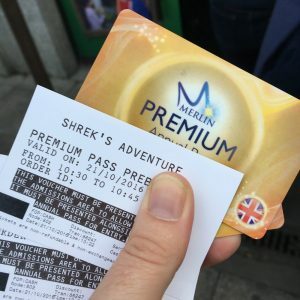 I must admit, that with children aged 13 and 11, Shrek’s Adventure would not be my Merlin attraction of choice. I figure that this attraction is aimed at a much younger audience. 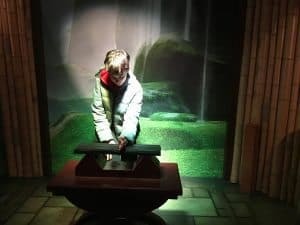 It is situated on the South Bank, right next door to the London Dungeon and has a similar approach, so I imagine it would be fantastic for families where half of them wanted to go to the Dungeon and others were too young. However my son is getting right into his role as a Merlin Annual Pass blog ambassador for the year, and he decided that he was happy to suspend disbelief and try out Shrek’s Adventure as he figured it would probably be cute and quite fun. The idea is simple. Once you have purchased your ticket, you join a group of people (maximum 40) who are taken on a guided tour of the attraction, going from room to room. In each room there are live actors, who put on a performance telling you a bit of the story. Sometimes you are standing up and sometimes you get to sit down. Some rooms have special effects, lighting, video clips, sounds and other things I’m not supposed to tell you about. 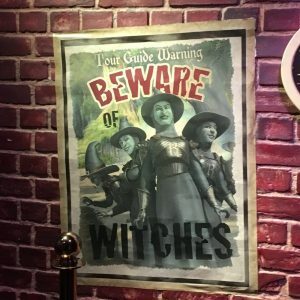 One thing which makes it difficult to do a blog review is that you are not allowed to take any photos or video during the live action part of the tour, so here is the official sneak peek of the attraction, which I think does a really good job of showing what it is all about. I thought that parts of this tour were excellent. The 4d bus ride at the beginning was really amazing – I can imagine some younger children could really believe that they had flown to somewhere else. 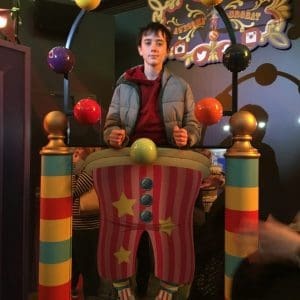 I also liked the fact that a lot of the actors chose children from the audience who had to take items from one room to the next and form a part of the story. Occasionally parents were chosen too, for a little bit of ribbing and humour. 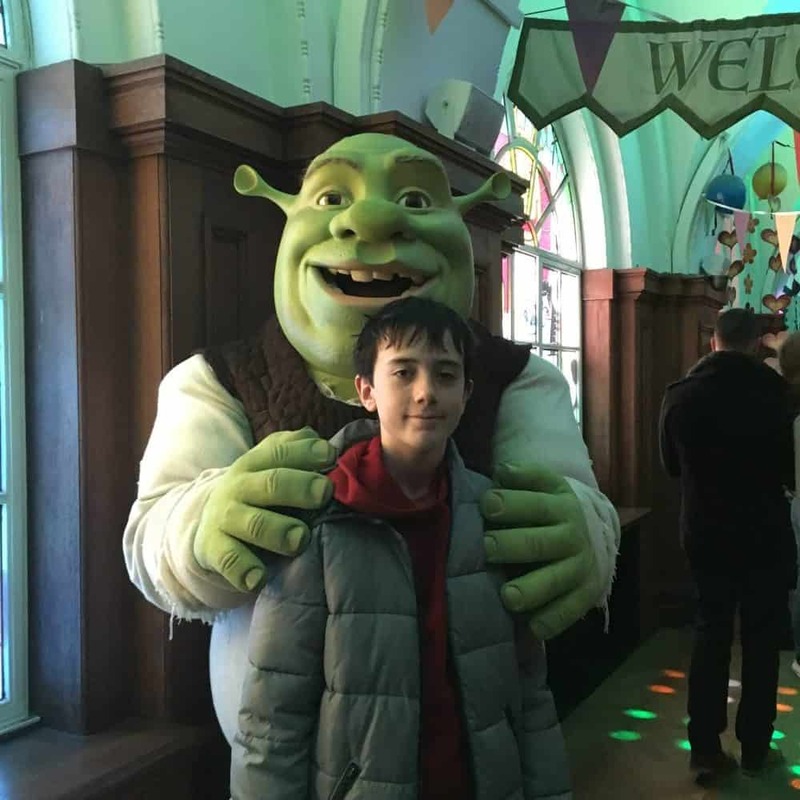 Once the live action bit was over and you are officially back on dry land in London, there are lots of photo opportunities, featuring characters from Shrek and a whole lot of other cartoon films. 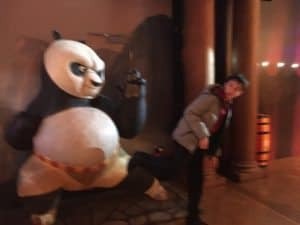 My over-age son was starting to lose the plot at this point, and had to be cajoled to join in for the sake of my blog, but I could see that the younger children in our group were really enjoying themselves, posing happily for their parents with each character. The one bit I didn’t really like was the fact that they took several green screen photos of you during the tour and then presented you with a special album of your photos as you queued to get to the lifts at the end. Everyone was encouraged to have a session with a sales consultant to buy photos and souvenirs – you had to go through the room with the sales people to get to the lifts. I wasn’t at all interested in the souvenir photos but the set up made it feel quite awkward to just give the book back to somebody without spending time with the sales team. 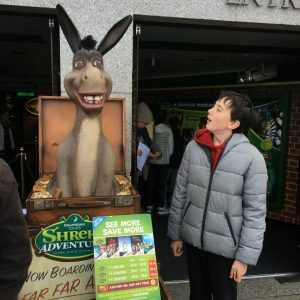 So in summary, I would say that Shrek’s Adventure is a great day out, especially for families with younger children, and good natured older ones who don’t mind pretending to be younger. 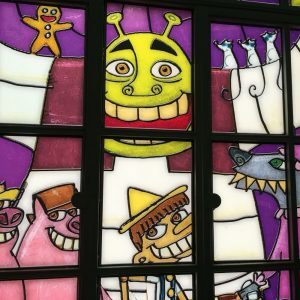 If you are taking very young children, it is helpful if you have watched the Shrek film that involves the Rumplstiltskin character (sorry I forget which one that is), as many of the characters from that film show up here and the plot is loosely based around it. I thought the show was very clever, well presented and very entertaining, and judging by the squeals and giggles from the younger children in our party it was really hitting the spot with them too.